Please scroll down for more pictures. KIT BUILT LOCOMOTIVE and Coach Set. 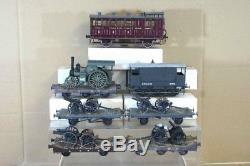 SE&CR LSWR WWI ARMY GUN WAGON TRAIN SET with TRACTION ENGINE. This is a stunning Kit built WWI Military Wagon Train set. PROFESSIONALLY MADE, PAINTED and Weathered. For 2 or 3 Rail Operation. The conflat wagons are made from White Metal kits with timber planking floors. The Brake Coach is scratch built from Plasticard. Grey Flat wagons and Guards van are made from what looks like a modified Ratio plastic kit. All items have sprung buffers, scale wheels and hook and chain couplings. The Canon and Limber wagon loads are generally highly detailed white metal kits. The Traction engine is also white metal. LSWR 6 Wheel LOMAC with Lafayette Traction Engine Load. LSWR LOMAC with Gun and Limber Load. LSWR 6 Wheel LOMAC with Kitchen Wagon and Limber Load. 2 Grey wagons with Gun and Limber Load. SE&CR Maroon 3rd Class Brake Coach No 317. A wonderful wagon set for your layout. But this depends on box size finally used, item sizes and weight. Buyers to pay via cheque. Thanks for looking and good luck. The item "O GAUGE KIT BUILT SE&CR LSWR WWI ARMY GUN WAGON TRAIN SET & TRACTION ENGINE mv" is in sale since Tuesday, July 24, 2012. This item is in the category "Collectables\Model Railways & Trains\O Gauge\Wagons". The seller is "gostude" and is located in Warwickshire, United Kingdom. This item can be shipped worldwide.